Cicily here with a quick tip I came across on Pinterest. I’m one of those scrapbookers who likes to scrap what I want to scrap when I want to scrap it. 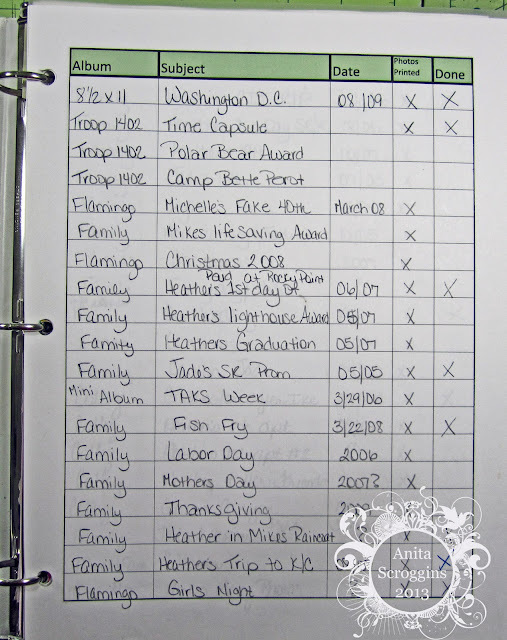 I have several different scrapbooks in progress, vacations, camping, kids, and family, to name a few. I’ll admit I’ve spent time looking for pictures I was positive I’d printed or came across pictures I had already scrapped. I’d rather be a little more organized with my layout progress so that’s why I loved this idea. This idea came from Anita at the Flamingo Chronicles. At a glance I can see what I have in progress, what’s ready to scrapbook or if I need to print pictures. I’m just getting started on this process so I will let you know how it works. Sometimes the simplest items can work the best for storage. Many of us are scrapbookers, and even if you are not, I am sure you have some memorabilia you need to store. 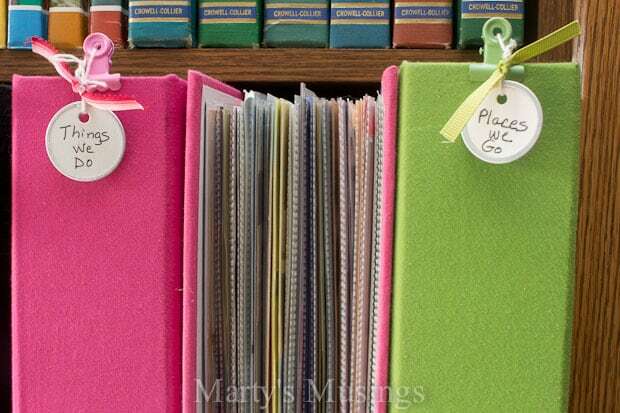 A simple scrapbook storage box can be the perfect solution to store loose items. For those of us that scrapbook, maybe you need a place to store memorabilia until you have time to scrap it. Ticket stubs, pamphlets, receipts, small tokens from a vacation – all of these need to go somewhere until you have time to put them in an album. And if you don’t scrapbook, maybe there are special items you want to hang onto, such as, special art work from your children, cards or love notes. These boxes come in all sizes and colors. I have a large white one that sits on top of my bookshelf to hold all the special items my kids make for me. I haven’t decided yet if I want to put these in a scrapbook album or not, but for now, if I need a little pick me up, I can look through the box. How do you store memorabilia? Here’s a big welcome to Lori from Thrifty Décor Mom! Thanks for joining us today! Hello! My name is Lori and I blog over at Thrifty Decor Mom. I live in Lewis Center, Ohio with my Handyman Hubby, 2 teenage daughters and a Maltese named Benny. Decorating is my passion and I love the challenge of putting a room together on a tight budget. 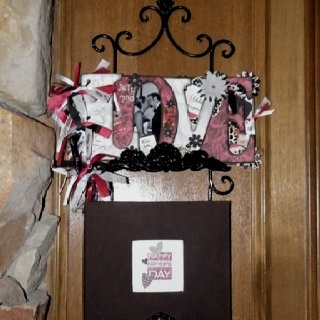 In addition to decorating I also enjoy scrapbooking, stamping and crafting. 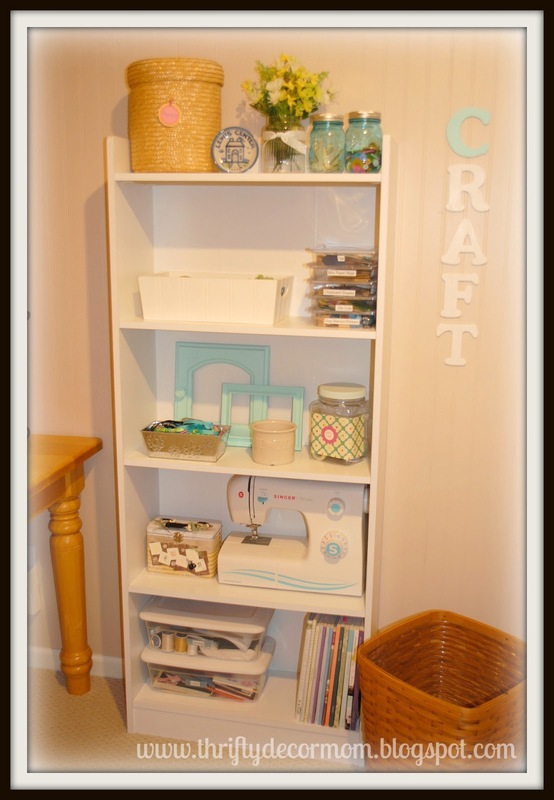 I’m so excited to share my organized craft space with you today! My supplies were an unorganized mess and I needed a permanent place to scrapbook so I decided to create a space just for me! 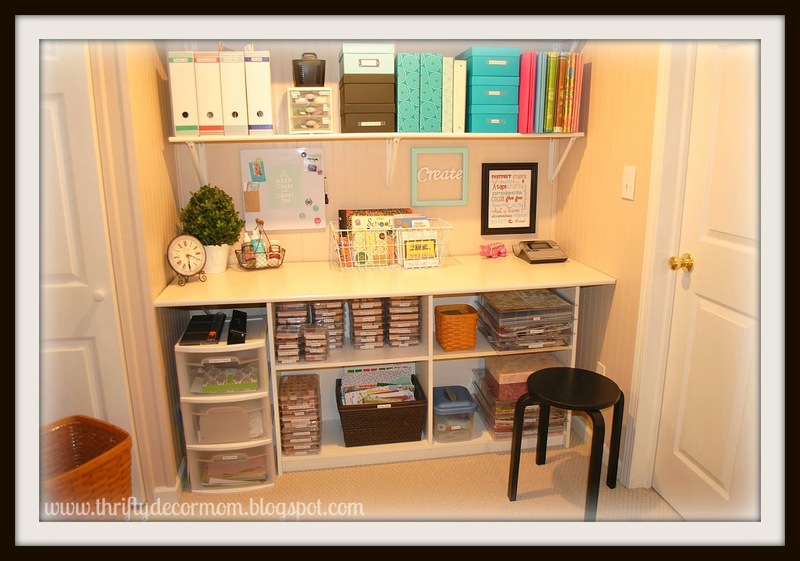 What kind of budget did you have when organizing your space? Not much! I didn’t have a set budget but I wanted to create the space without spending much money. To do this I had to get creative and use items from around my house. I also repurposed some items to work in this space. The table was part of our dining room set that we never used. We were going to sell it but decided to try it here instead and it’s worked out perfectly! 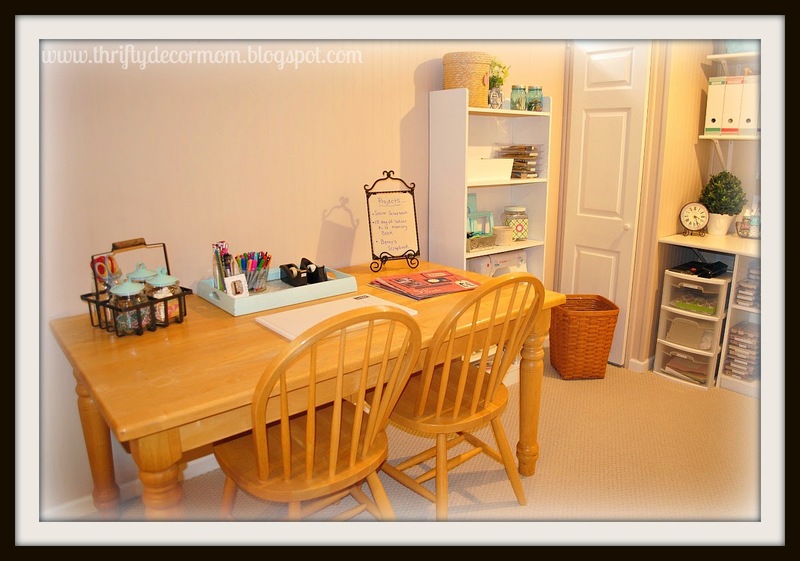 I love having a large area to spread out pictures and scrapbooking supplies. It also makes a great place for the kids to do homework. This bookcase used to be in my daughters bedroom. She no longer wanted it so I decided to use it here. Now my sewing and scrapbooking supplies are all organized and within reach. Besides working with little to no budget, the space I had to work with was definitely a challenge. 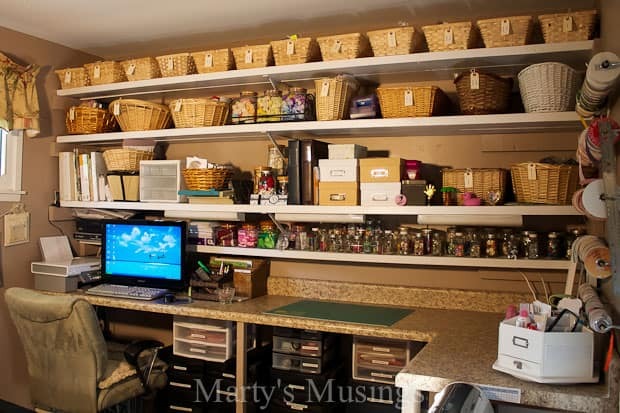 My craft space is in a small corner of our finished basement. It isn’t in a separate room so I couldn’t close the door and hide the clutter. I had to get creative with storage and make it pretty yet functional. This bookcase was given to us years ago for free. The top was scratched up and it wasn’t in great condition. To create a larger work area we covered it with a sheet of white laminate shelving. 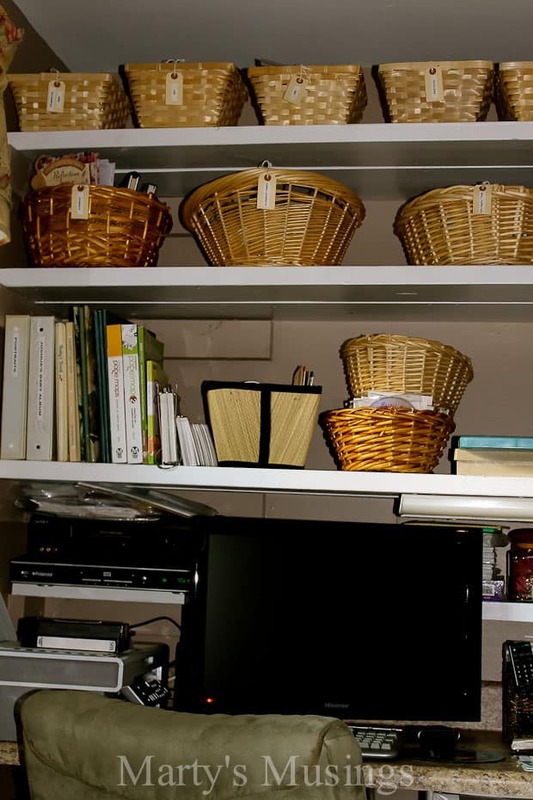 The shelves are the same laminate and add much needed vertical storage. I used a lot of baskets and plastic bins from around my house to store supplies. 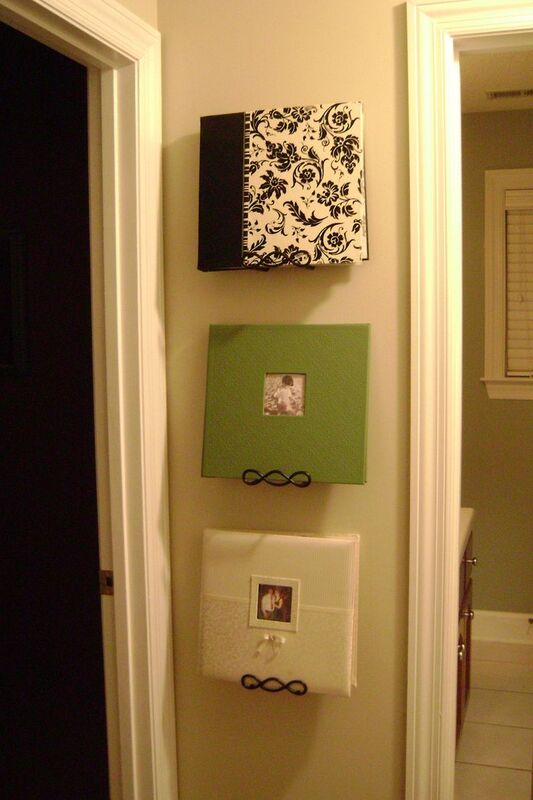 The photo boxes were purchased on sale at craft stores and are great for storage! 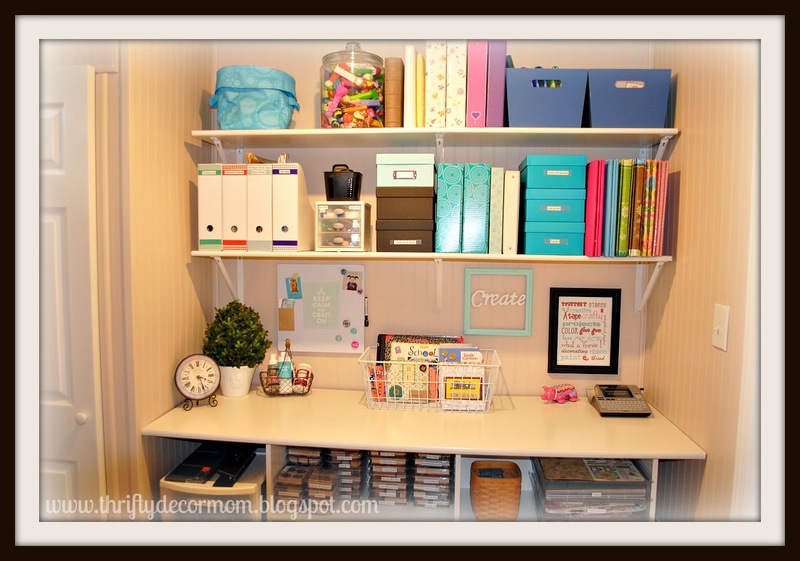 Are you an “organize it once” kind of girl or are your storage solutions constantly evolving? My whole house is constantly evolving! Nothing stays in the same place for long and I’m always tweaking the smallest detail. It drives my family crazy because they go to look for something and it’s been moved somewhere else! I added some fun and color to the space without spending a lot of money. I printed out free subway art, painted some old frames and purchased inexpensive wood craft letters and a white/magnetic board. What is one thing you’d like to improve about your storage/organization? I wish I had a separate room that could be closed off from the rest of the basement. A bigger space would be nice too but neither of those are an option at this time. Right now I’m planning on repainting the whole basement a lighter color so that will really give the space a fresh look. Thanks so much for allowing me to share my craft space with you! I share all my creative and thrifty ideas at Thrifty Decor Mom and I’d love for you to stop by and say hi! 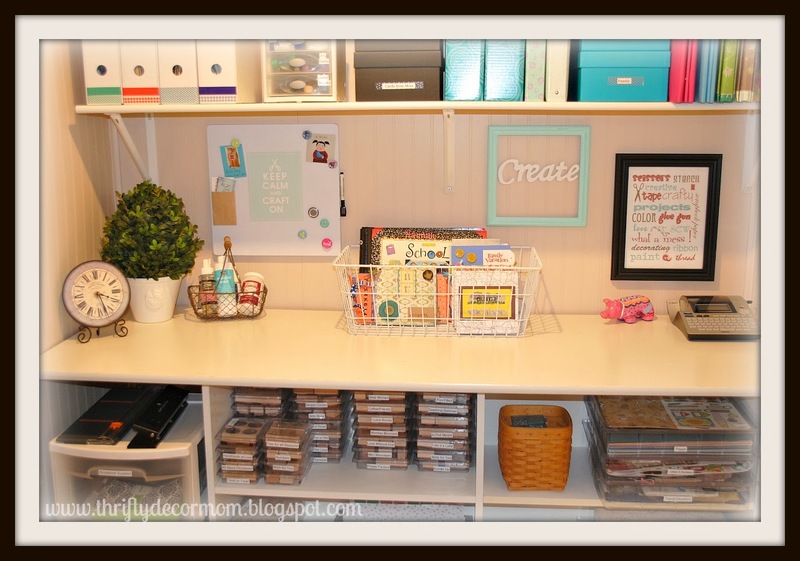 I think you are going to love bonus room converted to a stamping room! Also, the cabinets and island were all Craigslist finds! I love a bargain shopper! 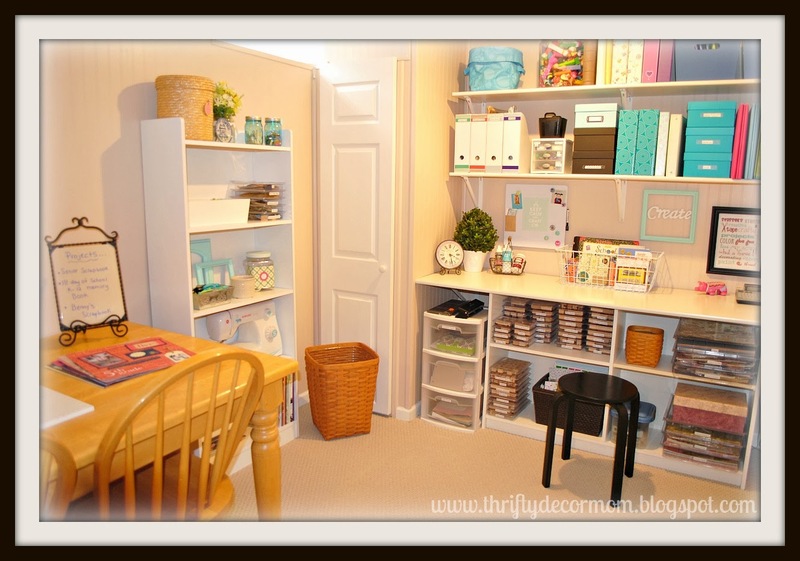 For a ton of details about this space, please visit Kim over at Dragonfly Dreams! A little tour, a review and a BIG giveaway! I’ve been itching to share a product review for a few months now, and today is the day! I can’t show you how this product works, though, without giving you a little tour of my craft area. Ready? I have a very small crafting space. In fact, this space works as my entry, dining area and scrap area. I know some of you can relate. I’m lucky in that I do actually have an entire bookshelf I can devote just to crafty things. Here’s the thing, all of my supplies with the exception of two dresser drawers in another part of the house (one drawer holds cardstock, chipboard and items waiting to be altered and the other drawer holds completed mini-albums for my Etsy shop). and a couple of items on my crafting table are stored on this bookshelf. You read it right. All of my supplies are here. I keep my crafting table pretty clean since it plays so many roles. Washi tape, tools in a spinner, a box to hold wood veneer pieces, buttons and ribbon, and a clear acrylic tray that I keep “must use now because I loooove it” embellishments in. And my Silhouette. To be honest, a lot of the time it gets put on the floor in the corner closest to the window. And that’s about it. I’m a scrapping minimalist (at least that’s what I consider myself – I’m sure there are others out there that work in far less space and with far fewer supplies). If I bring something in, it has to be useful. And I’ve learned that if I don’t use it in 6 months, with the exception of a very few, select items, I’m never going to use it. So every 4 or 5 months I am ruthless about cleaning out every single type of supply. I tend to invest in tools (punches, paper trimmers, crop-a-dile) only after a lot of hemming and hawing (that’s southern, ya’ll) because they take up precious space. You’ll notice this bookshelf doesn’t hold a ton of supplies. Here’s a little diagram. To be honest, those drawers are pretty empty – I could probably even downsize, but I like to have space for when my supplies fluctuate. And now for the shameless plug. Keeping my supplies organized and in this small of a space would not be possible without that rack on the top of my bookshelf. It’s a Scrap Rack. Before I start extolling it’s virtues…I paid for this Scrap Rack myself. I am not being compensated for anything I say here. A Scrap Rack is a base that holds three ring spinders on heavy duty velcro…which in turn hold heavy duty page protectors. Purchasing a Scrap Rack is a big deal. First, it’s an investment. Second, they aren’t sold in stores, which was difficult for me, because I like to feel, touch and caress anything I am considering buying, especially when it costs a lot. I looked at it for months online. I watched a ton of videos, read reviews. I even sent emails to a couple of people who sold (not to me, unfortunately) their Scrap Racks. I wanted to know why it didn’t work out for them. And then, I trekked to the Stamp Expo and saw one in person…and officially grilled Tiffany, Scrap Rack’s creator, with questions. What does minet hold? All of my patterned paper, letters (stickers, thickers, wood veneer), embellishments, acrylic stamps, and projects where I’ve pulled paper and embellishments and am just waiting for time to work on them. It holds a lot! I label my patterned paper with washi tape so it can be easily relabeled. It’s all stored in Side Loader Single pages. Thickers and letters are stored in Double X-Long Storage Pages. To be honest, I can never have enough of these particular pages. I use these for letters and embellishments as well. 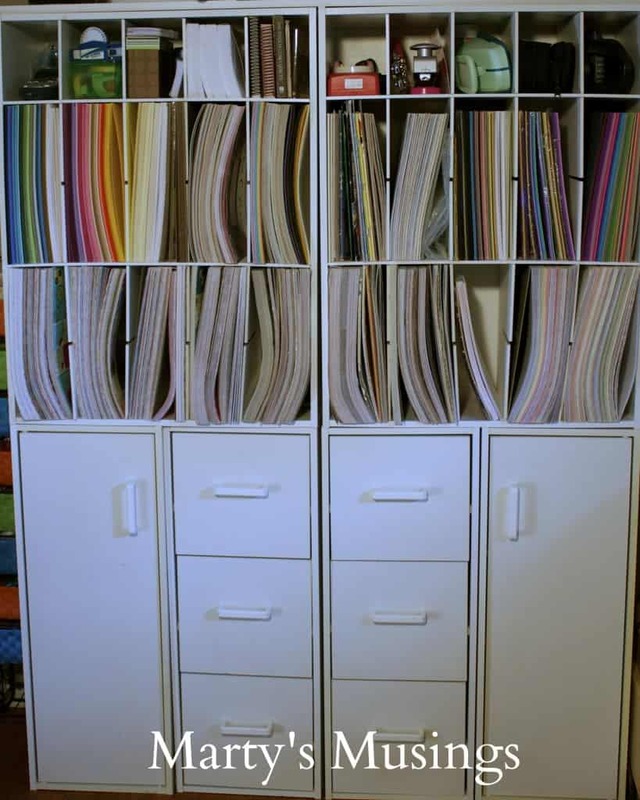 I use a combination of Triple Play Storage Pages, Fabulous Four Storage Pages, Perfect Six Storage Pages and Straight Eight Storage Pages for my remaining supplies. The one exception is acrylic stamps. My collection is pretty small and I don’t have a problem removing the branding/packaging from them – so they are stored in Inque Boutique Stamp Keepers. They are basically a plastic clam-shell – acrylic stamps stick to the bottom plastic and they don’t slide around hardly at all. I purchased these a long time ago – and they are actually no longer being made. But, Scrap Rack now has something identical (they may even be better because they have tabs on the sides), called Klearly Krafty Storage Trays. One stop shopping! I’ve been using the Scrap Rack for over a year now – so I feel highly qualified to give you a list of pros and cons. I can customize every single page based on the supplies I’m storing. Which means, when I realize something isn’t working, I can try another type of storage page easily, without investing a ton of money. The pages do sag a little. This doesn’t bother me nearly as much as I thought it would. The fuller my Scrap Rack, the less the sag. See – the pro list is way better! 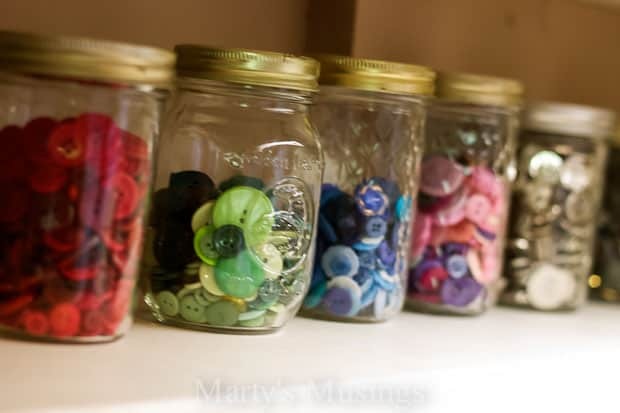 When I placed my first order I ordered Trader’s Twelve Storage Pages and Sweet Sixteen Basic Storage Pages, thinking I would store loose buttons, brads, ribbon, etc. These did not work for me. It to difficult to get things in and out. I had a hard time keeping the flaps closed so that my items wouldn’t fall out when I turned the pages. They just weren’t for me. I’ve also discovered that Straight Eight Storage Pages don’t work for me either….mostly because the type of embellishments I buy don’t seem to fit in the pockets. I tend to need the larger pocket pages. This is probably hugely dependent on the types of embellishments I gravitate to. Something that makes a huge difference in how your Scrap Rack works Order dividers. More than you think you actually need. 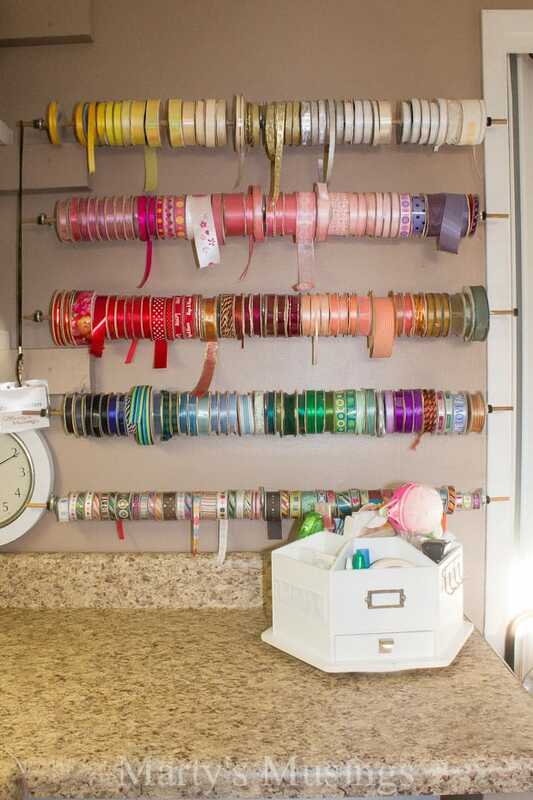 They are super sturdy….and the more you have, the easier it is to navigate your Scrap Rack. I don’t actually label mine – I don’t even use them to divide “sections”. They are there as support for the page protectors. The more dividers you have, the less your pages sag. Trust me on this one. And now that I’ve written a book – do you have a Scrap Rack? Do you have any specific questions for me? I’d love to take a stab at answering them! And now for the big, big thing! Want 15% off of your order at Scrap Rack? Use coupon code CSI15 until November 15th! Want to win a $150 gift card to purchase your very own Scrap Rack? All you have to do comment here and letting us know which item in your crafty area you think is the most organized! We will announce the winners of our giveaway on October 31st! Author Rebecca BoyerPosted on October 22, 2013 October 20, 2013 Categories All Craft Rooms, Contributor Team Studio/Space Tour, Giveaway, Giveaways, Product Highlight, Product ReviewTags craft room, Scrap Rack, scrapbook706 Comments on A little tour, a review and a BIG giveaway! Cicily here with a quick tip today. We put so much time and effort into our beautiful scrapbook pages, often times only to pack them away. 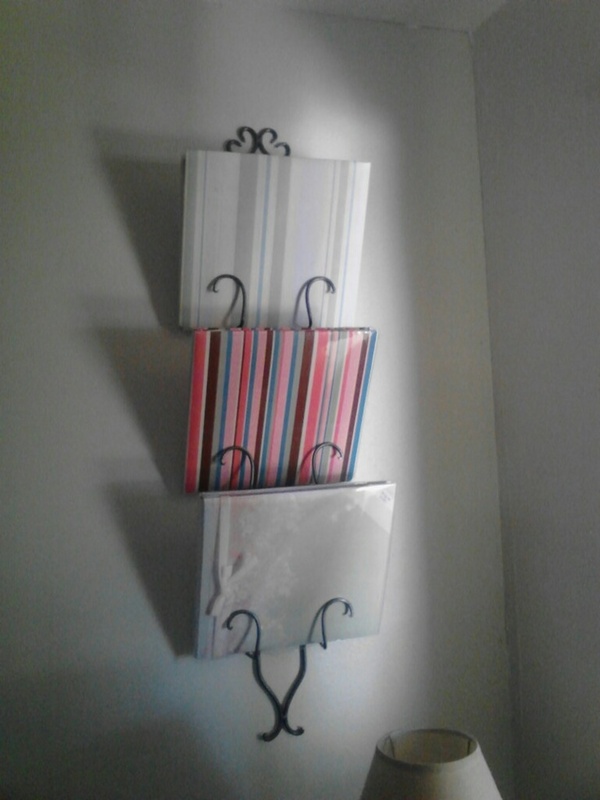 How about using a plate rack to display them on the wall? I have my wall picked out!